Zipper - Close, so close. Gadget: Chip, I have a confession to make, Zipper and I are in love. KS - Again, so close but Loneheart's was just slightly better. 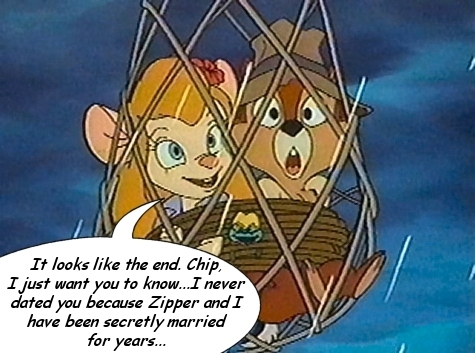 Gadget: Golly, now that I've had time to think about it, I think I'll marry Zipper instead of you, Chip. Rennod - Oh, she can be so innocently callous sometimes! Caption: It's been said she doesn't notice them, but would she take it *this* far? GADGET: You want just ONE slave? Oh, okay! Bye, Chip! Gadget: Actually Chip, I'm Lahwhinie. Going through all the trouble switching places again was really worth that kiss you gave me! Gadget: "Captured a mans heart...check! Well captured the man, same thing. Tied a knot...check! So Chip when does the honeymoon begin?" Gadget: But Chip, you said you wanted to "hang out with me and learn the ropes" of inventing! Gadget: Actually Chip, considering we have been on this island for three weeks without a shower or change of clothes, the rain is a good thing. Robert Knaus - For Chip, I think once is enough in this case. GADGET: So...what do you want to do on our next date? Gadget: Golly, when you said I'd look good in fishnets, i thought this is what you meant! Gadget: Michael Eisner is gonna leave us here until we get released on DVD, ya know.